In a marked departure from industry practice, Facebook is disclosing the designs and specs for its new data center in Prineville, Oregon. The social network today launched the Open Compute Project, through which is its releasing the details of its energy efficient data center design. Dell, Rackspace Hosting and Zynga indicated they would adopt elements of the Open Compute designs. In a marked departure from industry practice, Facebook is disclosing the designs and specs for its new data center in Prineville, Oregon. The social network today launched the Open Compute Project, through which it is releasing the details of its energy efficient data center design, as well as its custom designs for servers, power supplies and UPS units. A number of major Internet companies, including cloud computing provider Rackspace Hosting and gaming giant Zynga, indicated that would likely adopt elements of the Open Compute designs. Meanwhile, server vendor Dell said it had already integrated the Open Compute motherboard design into servers. Many leading data center providers are secretive about the details of their data center designs and operations (see The Fight Club Rule of Data Center Secrecy), believing any proprietary designs offer a competitive advantage over business rivals. Other companies cite security concerns in electing to cloak their data center operations in secrecy. "We're not the only ones who need the kind of hardware we're building out," said Facebook CEO Mark Zuckerberg. "This should make it easier and more cost-effective for everyone building social applications to do what they're doing." "The idea is really to push the industry forward," said Amir Michael, a Hardware Engineer at Facebook. "This will be an initiative to share our best practices with the industry. We don't hold this technology as a key to our business. We want to help others build infrastructure more efficiently. Facebook is publishing the specifications and mechanical CAD files under the Open Web Foundation license, which grants a "worldwide, non-exclusive, no-charge, royalty-free, copyright license, without any obligation for accounting to Facebook, to reproduce, prepare derivative works ... and implement the specification to the full extent," the company said. Some of the designs featured in the Open Compute Project will be difficult for other companies to easily implement, as they rely upon an atypical power distribution and UPS configuration - an approach which makes them most valuable in new construction rather than retrofitting existing operations. In addition, Facebook's data center design relies upon free cooling - the use of fresh air rather than air conditioning to cool the servers. The ability to use free cooling is guided by geography, with cooler climates working best. But Facebook has lined up a meaningful list of industry players to participate in the initiative. Advanced Micro Devices, Dell, HP and Intel are among the companies that co-developed technology with Facebook. In addition, Dell's Data Center Solutions business will design and build servers based on the Open Compute Project specification. 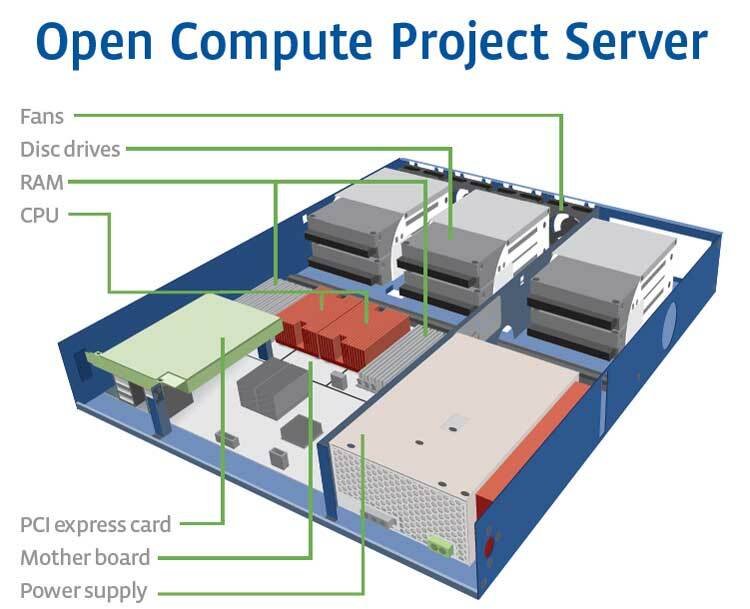 Synnex Corporation will also serve as a vendor for Open Compute Project servers, offering fully integrated and tested solutions based on customers' specifications. "Facebook has contributed advanced reference designs for ongoing data center and hardware innovation," said Forrest Norrod, Vice President and General Manager for Worldwide Server Platforms for Dell. "We look forward to collaborating with like-minded technology providers and partners as we seek ways to learn from and further advance these designs." Graham Weston, the chairman of Rackspace, said some of the ideas designed by Facebook and released in the Open Compute project could save the company millions in power costs. "We have been developing our own IP (intellectual property) in the data center, and we'll be flushing some of that to go with the Open Compute design." Zynga looks like another likely adopter. "We look forward to working with the Open Compute Project to exchange best practices and help the entire industry advance in the areas of power efficiency, design and manageability," said CTO Cadir Lee.